So, a whole week in Ocean City! Sun, sand, surf . . . uh, no. 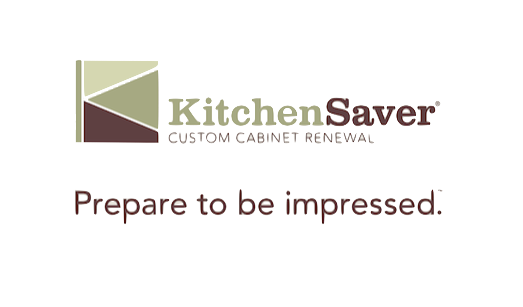 I’m helping Ken from KitchenSaver reface the cabinets. Actually, rebuild them, considering all the extra work being done. And I’m not really helping, just being here to answer questions and sort through the inevitable problems as they arise. For instance, what to do with the pipes that weren’t supposed to be where they are? 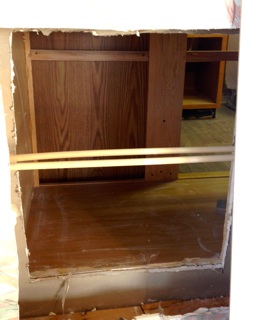 We closed off one cabinet that was unreachable from the kitchen and planned to open the back of it from the other side of the counter, only to find that the pipes to the sink come in from the OUTSIDE wall through the counter space behind the cabinet. Thus we have, in the middle of the new opening, a set of PVC pipes just itchin’ for a nickin’. This photo was taken AFTER he carefully cut out the 2×6 the pipes ran through, which would have also inhibited the cabinet access. Then, the under cabinet lighting the electrician was planning to install was not the under cabinet lighting everyone else was expecting. Thus we had to figure a workaround to incorporate the new lighting. Fortunately, Ken has seen just about everything and can figure out what to do. Yesterday, after Ken finished his workday, I got to do the “fun” stuff! If you’ve ever removed a “popcorn” ceiling – yeah, you know what I’m talking about – you know how much “fun” it can be. It’s easy. Just wet the ceiling with a water sprayer, then take a large drywall knife (6-8” putty knife) and scrape it down to the drywall! Comes right off . . . all over everything, including you. Or in this case, me. And the new floor. And the new kitchen counter. Now, I’m no dummy. I covered everything with plastic before I started, and I held up a trashcan with one hand while I scraped with the other. Even so, it fell on me, and of course I walked in whatever missed the trashcan. I left white marks everywhere I walked. Even though it doesn’t stain, I hope we can clean it all off the new floor before Janet sees it. After that, I got to install two corbels under the new counter. We (meaning I) had not expected to need these, but my recollection of the counter width I had ordered was not exactly in accord with reality. Thus instead of a 5” overhang on a 16” counter, I have a 9” overhang on an 18” counter. It’s all good – except if one intends to lean on said overhang, one better dang sight have something underneath it. So with Loctite Power Grab Construction Adhesive, my trusty drill and some 3½ inch screws, I set forth on my next adventure. The Power Grab was for the underside of the counter. 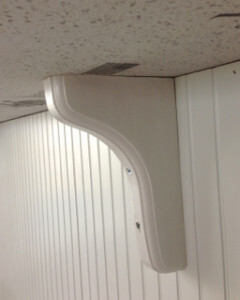 Ordinarily when one installs corbels, they go on before the counter and use keyhole screws in the back. But these had to be screwed in from the front, so the Power Grab was insurance. I predrilled holes in the corbels, attached them to the bar and underside of the counter with Power Grab, then started screwing them in . . . when the phone rang. Naturally it was a client. Always at a critical moment. I decided it would be best to let it go to voicemail. I finished screwing them in (to studs of course) and they look pretty good. I have to fill in the screwheads with some caulk and do a little touchup, but they look great and not too obtrusive. More importantly, the counter won’t fall into anyone’s lap.